Well that was a bit weird. Alexander Foliforov of the Gazprom-Rusvelo team won the cronoscalata. In cycling, weird is usually bad, but let’s not jump the gun. Foliforov, essentially an unknown, does have a certain amount of pedigree. In 2014, he came fourth in the Tour de l’Avenir, a Tour de France for under-23s which has been won by Nairo Quintana, Esteban Chaves and Warren Barguil in recent years. He also won a near-identical uphill time trial in the Grand Prix of Sochi last year, albeit against a much weaker field. It’s clearly something he’s good at. So let the horses be held. Surprise Russian performances do raise eyebrows, but tomorrow’s top riders do have to make their name somewhere. Let’s see what follows. So said Ned Boulting on a Cycling News highlights video. Not true. While Foliforov pipped Steven Kruijswijk by less than a second, the winning margin was many multiples of that in the opening time trial of this very race when Tom Dumoulin edged out Primoz Roglic by one hundredth of a second. On the evidence of this stage, Kruijswijk is currently the quickest uphill. Being as he’s already first, is historically stronger in the third week of the race and there are only mountains to come, he is not in a bad position at all. Of the major contenders, Alejandro Valverde was second on the day, 23 seconds behind Kruijswijk – but was already three minutes behind overall; while Esteban Chaves lost 40 seconds, but moved up to second because of what happened to Vincenzo Nibali. Nibali’s chain fell off. Then he couldn’t put it back on. Then he and the mechanic couldn’t put it back on while the mechanic was pushing him along. Concluding that it was fully knackered, he shoved it towards a fan and waited a few seconds for a replacement. Who knows how much time that cost him. Probably a bit less than the 2m10s he lost on the day. 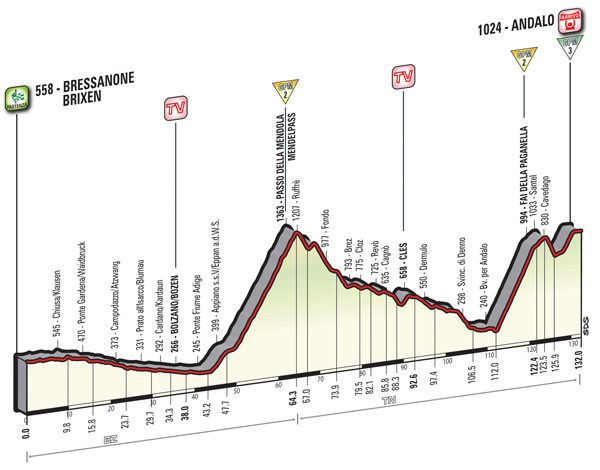 Rest day today (Monday) and then a pair of big long climbs on stage 16. They’re not dissimilar to the cronoscalata climb really. Worth noting that it’s a short stage, so people should be able to ride harder. Brace for some stodge. This area’s culinary delicacies include spaetzle (a type of noodle), knodel (a type of dumpling), wurst, sauerkraut and traditional corned beef.